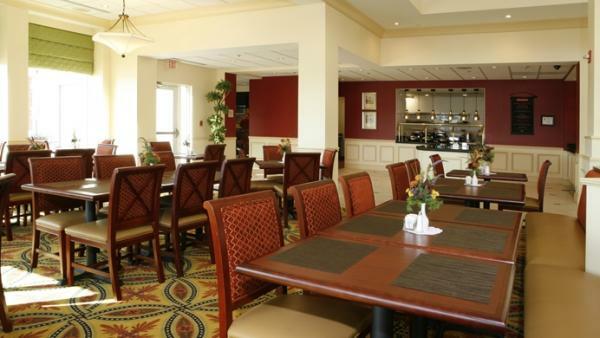 Located in the beautiful Hilton Garden Inn of Roanoke Rapids, serves breakfast, lunch and dinner seven days a week. Cooked to order breakfast done by an incredibly friendly staff. Not only do you get a full buffet of food, but you can order omelets, french toast, eggs any way you like them, and waffles. Lunch and a dinner menu too. Choose from such fantastic menu items as burgers, sandwiches, soups and salads with the signature Hilton touch, as well as more hearty entrees like salmon filet, peppercorn ribeye, chicken parmigiana, aldunio primavera and more.